The Keryflex Nail Restoration System was named one of the top 10 innovations in podiatric care by Podiatry Today. A podiatrist applies a patented, flexible resin nail over-top your fungus nails to improve the appearance of your feet while the new nail grows in. The application only takes about 15 minutes to put on, and patients need to come back every six to eight weeks for re-application. The nail doesn’t appear exactly “natural,” but it’s much better than the fungus nail, and it can be painted upon with nail polish. The cost ranges from $99 – $150. When painted, Keryflex provides a natural cover for fungus nails. 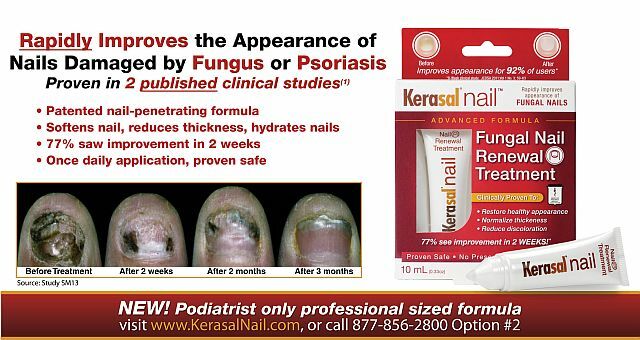 If you’d rather not see a podiatrist, you can try a product like the Kerasal Nail system, which is available over-the-counter in stores like Rite-Aid, CVS, and Wal-mart, or online at Amazon. Kerasal is a clear, colorless liquid that is applied to the nail to “normalize thickness, reduce discoloration, and hydrate the nail.” Some Amazon reviewers have reported visible results in as little as 30 days, but the manufacturer says it should take about three months to see real improvement in the nail’s appearance. Podiatrists or medical spa technicians can also perform a procedure known as “debridement,” which involves using nail nippers or chemicals to treat the fungal nails. According to Podiatry Today, “Although debridement does not treat the infection, it can decrease the fungal load of the nail and can complement medical therapy. It can also reduce pressure necrosis and improve the nail’s overall cosmetic appearance.” For extremely thick nails, you may have them mechanically thinned using a Micromat-3000 nail thinning device. The Micromat 3000 may be used to thin out thickened fungal nails. “I think the laser can improve the appearance of the nail, but it’s only temporary and it needs to be used again and again to maintain that improvement,” said Washington podiatrist, Lee Firestone. Like many other treatments, it takes about three months to see significant results. The benefit of laser toenail fungus removal is that it’s not just a cosmetic treatment. It also tackles the root cause by penetrating the nail bed and killing the fungus within. Unfortunately, the treatment costs around $1,000, and is not covered by insurance. Laser light can improve the look of nail fungus within months. While You Wait for the Cure, Be Sure to Prevent Recurrence of Fungal Nails! Many people with toenail fungus make the mistake of treating their feet, but failing to treat their footwear — which is teeming with fungal spores! The moment they put their fungus-infested shoes back on, they are recontaminating their feet, thus preventing any hope of getting rid of the fungus once and for all. The SteriShoe ultraviolet shoe sanitizer is a high-tech device that can eradicate infectious pathogens within 45 minutes. For less than $130, you can have the peace of mind in knowing that your shoes are fungus-free.